DVD Synopsis: Brace yourself for a fearsome fright fest...times four! Maestro of Mayhem Vincent Price narrates this quivering quartet of Edgar Allan Poe's most spine-tingling classics, including: "The Tell Tale Heart," "The Sphinx," and "The Pit and the Pendulum." Dripping with gruesome torture, live burials, monsters, madness and murder most foul, An Evening of Edgar Allan Poe will chill you to your very marrow! 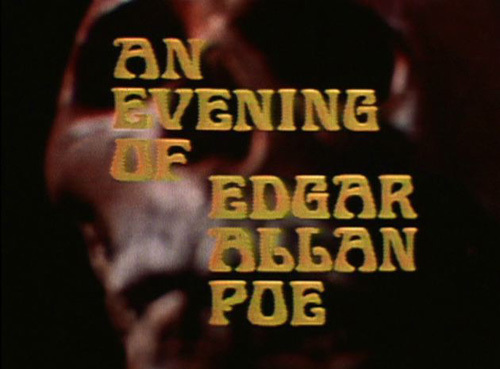 Made for television in 1972, An Evening of Edgar Allan Poe is little more than a filmed one-man show, featuring dramatic readings of four of Poe's classic, and most chilling, tales. What makes this particular show so enticing, however, is that all of the readings are performed by that master of horror, Mr. Vincent Price! Price does an excellent job with these four stories, bringing his personal brand of the macabre to each and every one. His wild-eyed flamboyance in “The Tell-Tale Heart” will send shivers up your spine, and he adds a hint of humor to the brief, yet engaging “The Sphinx”. With “The Cask of Amontillado”, my personal favorite of Poe's short stories, Price plays both of the tale's major roles (the murderour Montressor and the doomed Fortunato) with real gusto. Finally, we have “The Pit and the Pendulum”, which formed the basis of a film of the same title that Price starred in in 1961. Clocking in at just under an hour, An Evening of Edgar Allan Poe is a highly engaging stage show, offering four short stories penned by an American legend, and told by a true icon of Hollywood horror. This is absolutely amazing! Vincent Price reads this perfectly. @Melissa: I couldn't agree with you more! This was a very entertaining Made-For-TV presentation. Vincent Price has always been one of my favorite actors, and in my opinion, no performer was better suited to Poe's material than he was. As good as the clip I've attached is (and I agree that it's very, very good), his reading of both THE CASK OF AMONTILLADO and THE PIT AND THE PENDULUM are the true high-points of the show. Thanks for checking out the blog, and for the comment! That is a great clip and I'll have to track down the other stories. Cask of Amontillado is my favorite Poe story too. It's funny how Vincent Price became so associated with Poe. @Jeff: I'm sure the whole Price/Poe connection dates back to those 60's Roger Corman-directed movies like THE HOUSE OF USHER and PIT AND THE PENDULUM. As I said in my review of PENDULUM, no actor was better suited to Poe's material than Vincent Price. And definitely check out CASK OF AMONTILLADO... Price does this story total justice with his delivery. It's truly impressive.